Whatever Konstantin Korovin writes, each of his paintings is perceived as a holiday. Streets, sea, still lifes, human figures – all these familiar themes Korovin skillfully transforms in his paintings. In the 1910s, he is most interested in still lifes. At this time, the still life literally bursts into the work of many painters. In his work, the artist followed the principles of decorative impressionism, which can be seen on this canvas. At the time who rented a house in Gurzuf, Korovin wrote flowers, in particular roses. Still Life “On the Sea” in 1910 is part of the landscape, which is complemented by the golden sun and sea rocks. Korovin fascinates the viewer with the imaginary incompleteness of the work. This is created by brush strokes. Lush roses in a vase are placed on a table with a white and pink tablecloth. Flowers shimmer in the rays of the bright sun. Korovin does not rub the paint. 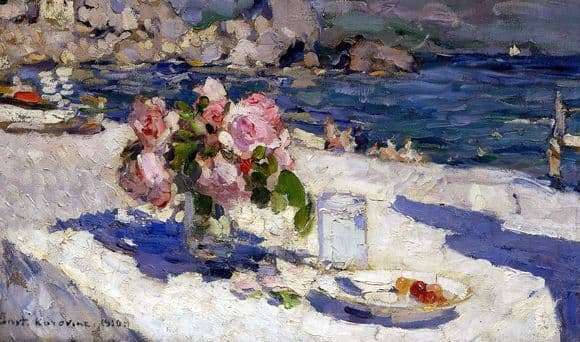 From it, he creates a whole composition: flower petals, a plate with berries, a glass, waves and rocks in the background of the canvas. Korovin follows this principle in order to create for the viewer a sense of the reality of what is happening here and now. Looking at the still life, creates the feeling that the paint did not have time to dry. Konstantin Korovin masterfully animates objects in his still lifes. Due to the texture of the image, one begins to reluctantly feel the scent of roses, the sea, the sounds of gulls and the quiet conversation of people admiring the Crimean nature.